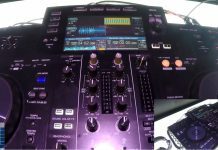 Home DJ Guides And Tutorials Pioneer DJ DDJ-SB3 Versus Pioneer DJ DDJ-400: Which One To Buy? If you are right now looking out for a new DJ controller, you might have a hard time choosing. 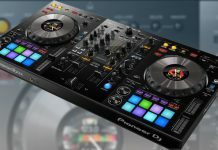 The market is quite cluttered, and even if you decide to go for a Pioneer DJ controller, the choices are many. The two Pioneer DJ controllers in this guide, the DDJ-400, and the DDJ-SB3, are closely related to each other, but essentially very different. 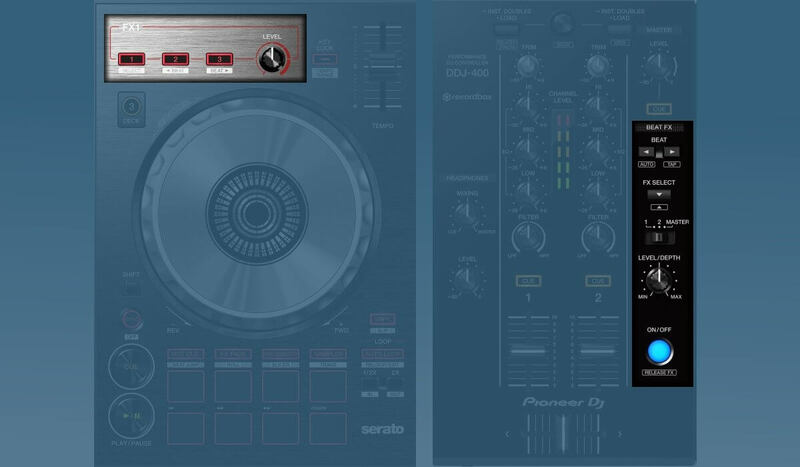 The DDJ-SB3 works with Serato DJ Intro, while the DDJ-400 is a Rekordbox DJ only controller. So right of the bat, you do need to figure out what software you prefer: are you going to go the Serato DJ route or the Rekordbox DJ route? Our comparison guide between the two might help you sort that question out. At the end of this guide, I do go quickly into the software question. Once you sort that out, it comes down which of the two pleases you most functionality wise. Let’s start! The Pioneer DJ DDJ-SB3 controller is a very complete controller for beginners. It comes with a series of unique performance features, including the Pad Scratch effect. The DDJ-SB3 is the third iteration of the entry-level Serato DJ Lite controller line from Pioneer DJ. 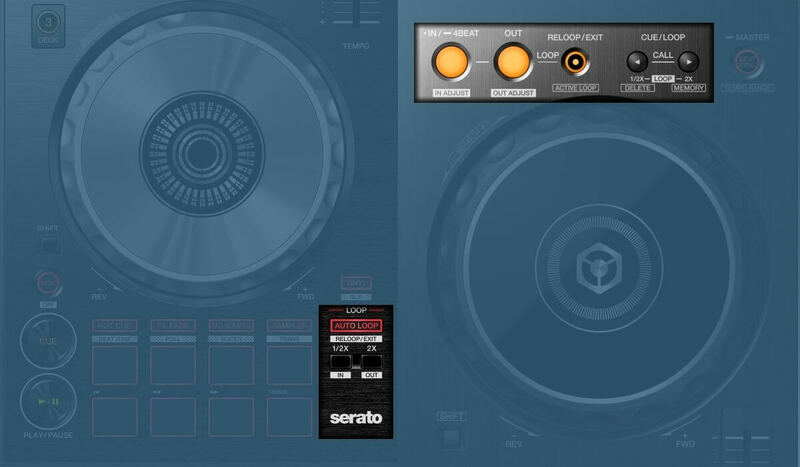 An important design change is the inclusion of a cue and play/pause buttons, and so that the performance pads can all be dedicated to the performance features such as Roll, Slicer, Hot Cues, FX fade… There is also the controversial Pad Scratch feature, that uses hot cues to launch sample routines pre-recorded by DJ Jazzy Jeff. The build quality of the DDJ-SB3 is very good, even if the case is entirely plastic. The jog wheels are very nice to use and have a good spin in them, certainly good enough for scratching. There is an RCA stereo output, a headphone output, and a mic input, which is enough if you are starting out. The controller comes with Serato DJ Lite but works with Serato DJ Pro as well if you are willing to pay the upgrade fee. The DDJ-400 is the first beginner DJ controller from Pioneer DJ that is built from the ground up for Rekordbox DJ. The feature layout is inspired by professional gear from Pioneer DJ. The DDJ-400 is the entry-level DJ controller for Rekordbox DJ that replaces the DDJ-RB. 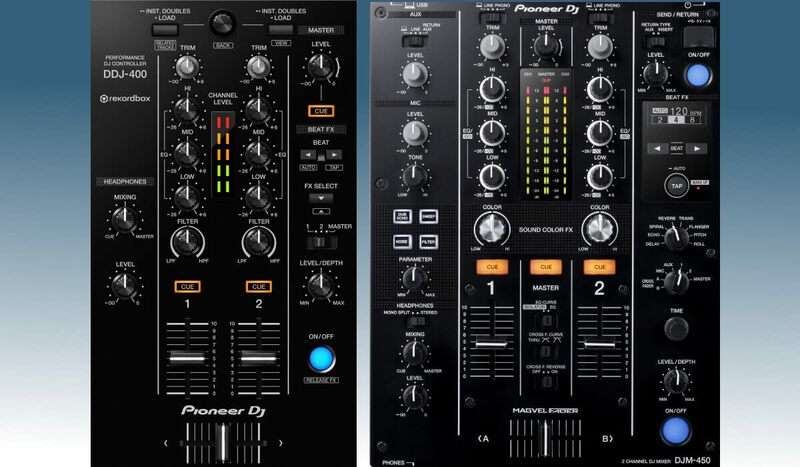 The DDJ-400 is quite similar to the SB3, but there are a few important differences. First of all, it’s a Rekordbox DJ controller, and it won’t work with Serato. Secondly, the effects section is integrated into the mixer and not into the decks as on the SB3. Finally, the DDJ-400 has (finally!) a decently sized pitch fader. The performance section has several different functions, from the usual ones such as Hot Cue and Sampler to Keyboard, Pad FX 1 and Pad FX 2, Beat Loop and Beat Jump. Input and output wise, the DDJ-400 keeps things simple: 1 RCA and 1 headphone output, and 1 mic input. Let’s go deeper into each set of features and compare them, side to side! 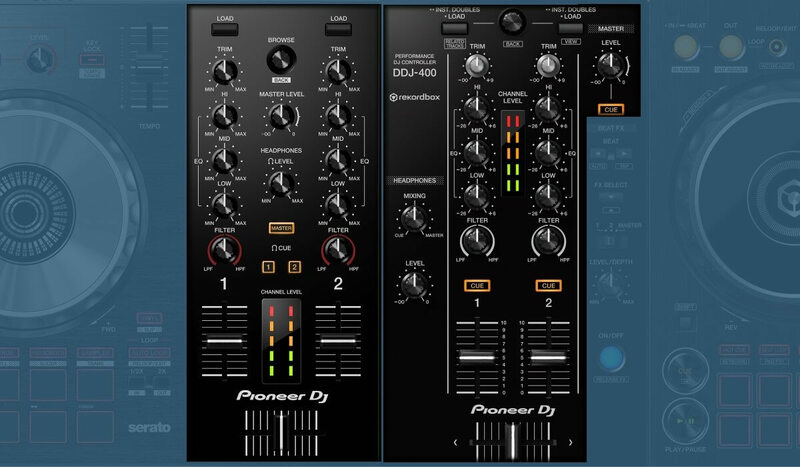 The effects section of the DDJ-SB3 (left) compared to the one on the DDJ-400 (right). This is probably the biggest difference between these two DJ controllers. While the DDJ-SB3 has a traditional effects section on top of each deck, the DDJ-400 takes a completely different approach and integrates the same controls on the right side of the mixer, much like on standalone mixers. The effects section of the DDJ-400 does look cool, and it does create a “two decks and a mixer” feeling on this entry-level controller. On the other hand, it does mean you need to assign the effects section to each deck in order to use them on that specific deck (it can also work on the master output channel) something that is not necessary on the SB3. 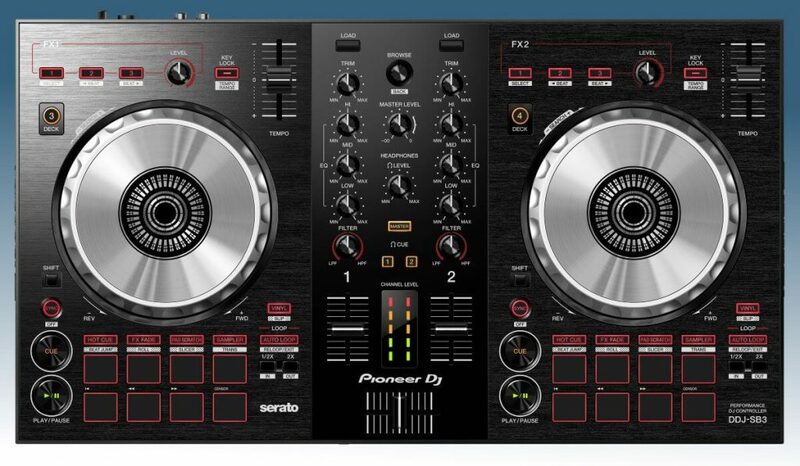 Secondly, while the big blue button to launch the effects (as on Pioneer DJ’s standalone mixers) is an improvement over the small buttons on top of each deck on the SB3, selecting an effect on the DDJ-400 is still as inconvenient: you need to look at the screen to see which effect is selected. On the SB3, each deck has 3 effects buttons, meaning that 3 effects can be selected at any time. On the DDJ-400 however, only 1 effect can be active at any time. I wish Pioneer DJ would have included a small, very inexpensive LCD screen that displays the selected effect. That would make this implementation so much easier to use, for only a small extra cost. DDJ-SB3 I really, really like the DDJ-400’s effects section integrated into the mixer, but it’s just less practical than the traditional way, mainly because there is no way to see what effect is selected on the controller itself. On the SB3, you preset you 3 most used effects for each deck and no more manipulations are needed. 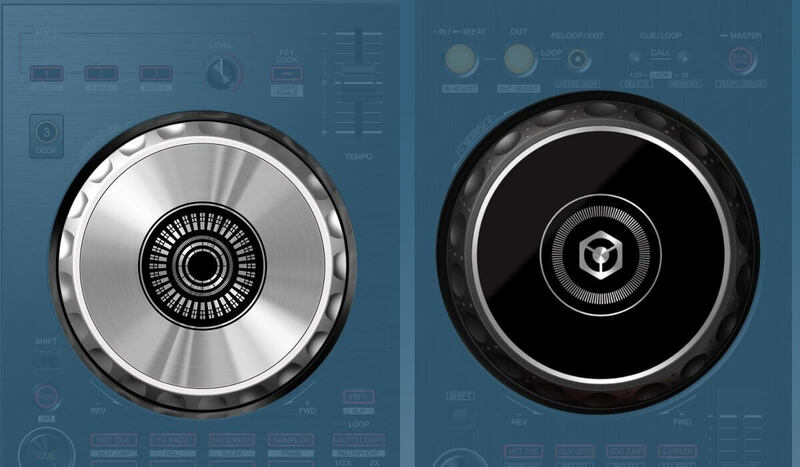 The jog wheels of the DDJ-SB3 (left) compared to the ones of the DDJ-400 (right). The jog wheels don’t differ really match on both controllers, but I do prefer the look of them on the DDJ-400. Also, the sides are rubberized on the DDJ-400 and that offers, in my opinion, a better grip when nudging. Apart from that, both platters are very similar, which means both are very good and have decent weight and spin. DDJ-400 I slightly prefer the jog wheel on the DDJ-400 for the simple reason it has rubberized sides that make track nudging a little bit easier. While both performance sections look very similar, they are quite different. The DDJ-SB3 has, next to the usual Serato DJ performance functions such as hot cue, roll, slicer, and sampler, also a few controller specific features: fx fade and pad scratch. With pad scratch, it’s possible to launch scratch patterns using pre-recorded scratch routines by DJ Jazzy Jeff and your defined hot cues. The DDJ-400 has a very similar approach, but the performance pads are a bit smaller. The pads support in this case the Rekordbox DJ performance features, those being: hot cue, beat loop, beat jump and sampler. The second level of features sits beneath the shift button: keyboard, pad fx1, pad fx2 and key shift. The keyboard and key shift functions are quite cool, as they allow for very cool tricks that certainly will impress your audience. A TIE Both controllers have very similar performance sections, but with, obviously, support for their respective supported software. The fact the pads are slightly bigger on the SB3 is an advantage, but those on the DDJ-400 are big enough for comfortable use. The looping section on the DDJ-400 looks far more impressive than the one on the DDJ-SB3, and that is mainly because it mimics the looping controls on much more expensive CDJ media players, such as the CDJ-2000NXS2. This is definitely a good thing since the big yellow buttons are easy to use. It’s possible to set a 4 beat autoloop by just pressing the left button. There is a separate button for re-looping, and buttons to change the size of the loop on the fly that double as call buttons for stored cues/loops. Not bad for a USD 250 controller! Things are much more basic on the DDJ-SB3. The looping controls consist of a big autoloop button and two buttons: one to half the loop and one to double the loop. Both buttons double as manual in/out loop buttons, but for that, you have to use the shift button, which makes a bit more impractical. DDJ-400 The loop section on the DDJ-400 is simply superior. It not only offers more functionality than the DDJ-SB3 but by being exactly like on professional gear from Pioneer DJ, it makes it so much easier for DJ’s that want to evolve from beginner equipment to professional gear to feel right at home when they do so. This might seem like a detail, but it’s not. The pitch faders on the entry-level Pioneer DJ controllers have bothered me since the DDJ-SB came along because they are so damned small. With the DDJ-400, Pioneer decided to move the pitch fader to a more “natural” place, on the bottom right of the decks. At the same time, the faders are now considerably larger, which means, more travel of the fader and thus more precision when adapting the pitch of two tracks. 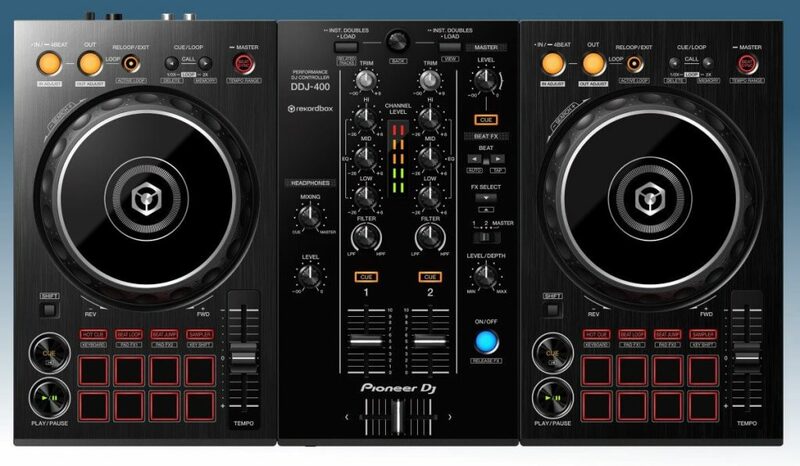 This is a huge improvement in my view and should provide beginning DJ’s a much more realistic DJing experience, and that will help them make the transition as they move away from their beginner Dj controller to more professional equipment later on. DDJ-400 The DDJ-400 is the obvious the winner here. It’s not that much of a difference between the two, but it’s significant and it deserves to be a deciding factor when choosing between one or the other. The DDJ-SB3 has a traditional entry-level mixer, very similar to most of the Pioneer DJ products in this category. The mixer is very narrow, and by consequence, the buttons, such as the cue buttons are small. The DDJ-400’s mixer wants to be a “baby standalone mixer”: the headphone controls on the left side, the channel controls in the center with the VU meters between the knobs and the effects section on the right. 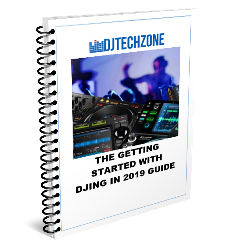 This is again a good evolution and a great way of giving beginner DJ’s a form factor that will make the transition to more professional equipment much easier. DDJ-400 Again, the DDJ-400 wins. 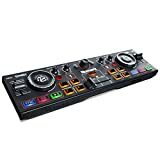 Not for having a more evolved mixer, but for laying out the controls in a way that is much more aligned with professional Pioneer DJ gear, and thus making the transition to such gear much easier for beginner DJ’s. 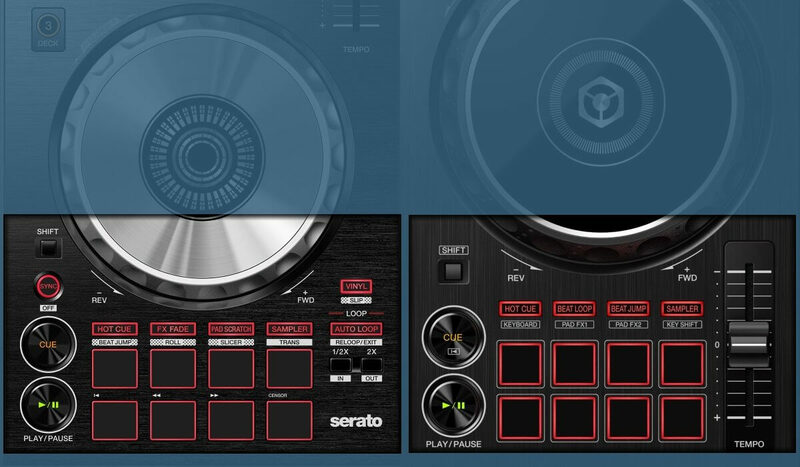 I don’t mean to pitch Serato DJ against Rekordbox DJ here, just to point out a few differences between the two when paired up with their respective controllers. The DDJ-400 comes with a full license to Rekordbox DJ, which includes the free Rekordbox preparation software. This means that included in the price of the controller, you get the full Rekordbox experience. The DDJ-SB3 comes with Serato DJ Intro, and if you want the full Serato experience, you need to pay for a full Serato DJ license. Still, Serato DJ Intro is pretty complete DJ software and fits the feature set of the DDJ-SB3 well. That being said, both packages (Serato DJ Pro and Rekordbox DJ) are very comparable in features, and are stable, reliable and offer room to grow. So in the end, choosing between the DDJ-SB3 and DDJ-400 shouldn’t be a software-driven choice. 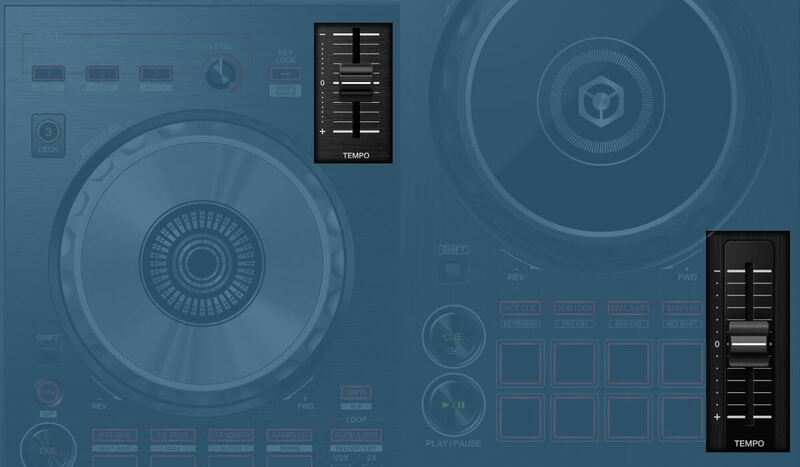 Do keep in mind that when using Rekordbox DJ, it will be much easier to use your Rekordbox prepared music library on professional DJ gear such as the CDJ media players, as both use the same software. 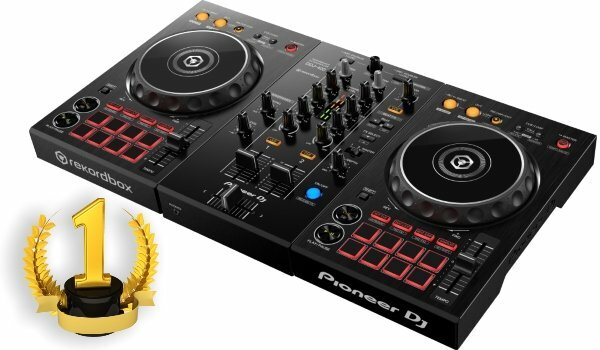 And the winner is… the DDJ-400! The DDJ-400 comes out as the best offering of the two here. 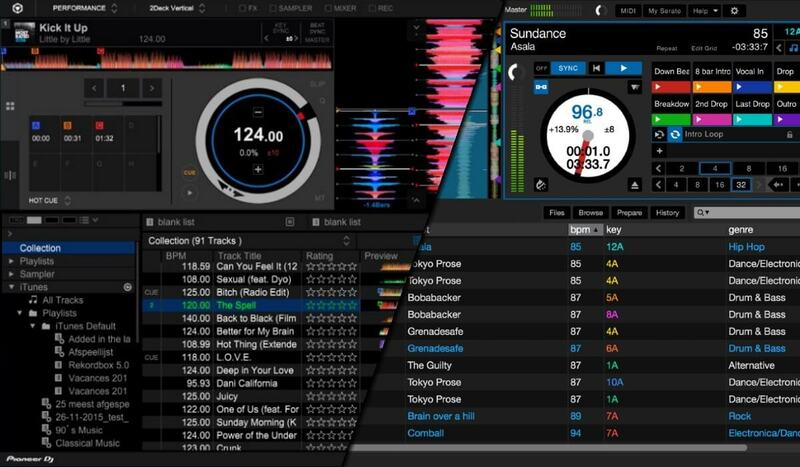 Priced almost equally, it has a better layout, and the software offering (full Rekordbox DJ license) makes it even more interesting! Agree or disagree with our choice? Comment below!